You don't have any products yet! The DST CR-10 Wedge's are transition clubs. They provide the natural progression for you to take the movements and feelings you have learned using the DST Compressor clubs and transition them successfully into your own conforming set of clubs. The CR-10 clubs have straight shafts but comprise the DST patent pending technology. The Hand Position Alignment Marker (HPAM technology) allows you to pre-set your impact position at address, just like the best ball strikers in history. The HPAM technology provides you with the information and position to consistently control the club face through impact. The HPAM technology on the hosel and amended sole angle allows you to locate, train and perfect the optimal impact position with clubs similar to the one’s you use on a daily basis. The first benefit of the HPAM technology is that by knowing where the optimal impact position is will improve your golf game, as the mind and body will use its athleticism to try and re-obtain the same position through impact as you were in at address. Research has shown that if golfers do not know where the optimal impact position is, they are unlikely to consistently reach it at impact. By having the knowledge of where the optimal impact position is, you are already provided with the information to make you a consistently better ball striker and player. The second benefit of the HPAM is that it guarantees consistency in your set up position. Setting up the same way every time is a crucial element in getting the fundamentals right before you even start your swing. You just need to align the HPAM (white line on the hosel) with the white leading groove on the club face and point both lines towards your eye line and you will have obtained the optimal impact position correctly. This is important because in order to become a consistently better ball striker, you need to have a repeatable pattern in your set up and swing. If you set up inconsistently, you will have inconsistent swings with varying results. By guaranteeing that you set up the same way every time, the HPAM will allow you to establish a repeatable pattern in your set up and swing which will ensure tighter shot dispersion. The sole of DST clubs have been designed to be wide and flat, so when a player sets up in a conventional address position and then pushes their hands forwards the sole of the club will orientate itself horizontally to the ground due to the designed forward hosel lean. In this position the club has been designed so that Hand Position Alignment Marker (HPAM - the groove which runs at an angle down the front of hosel) will point towards the players eyeline. In addition the HPAM will also appear to be aligned with the leading groove on the club head. 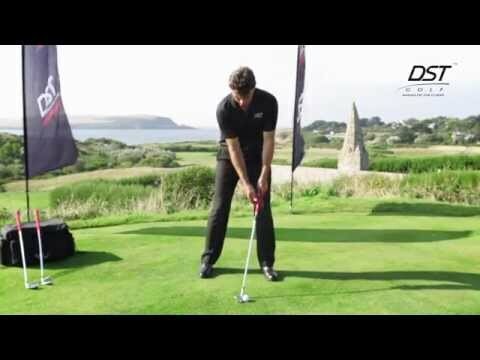 In this position the leading groove and the HPAM appear to be a continuation of the same line from the players perspective, the player will have located a set up position where the club shaft and their leading arm will be aligned with the center of the club head arc (their lead shoulder). From this position the player should make their normal swing and return the club to the same hand position through impact. All rights reserved. Copyright © 2013 DST Golf. Website by Giant Peach. Are you based in the USA or Canada? Are you based in the UK or Europe?